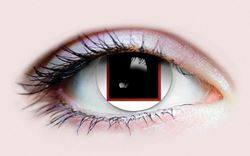 StudioFX has a wide selection on theatrical and Special Effects Contact lenses! 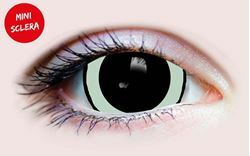 From more Natural styles, all the way to Sclera lenses. We've got you covered! 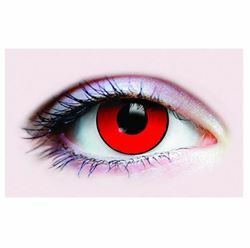 Acid I Mini SCLERA contact lenses from Primal These lenses feature a enlarged black circle (to imitate dilated pupils) with a light pink circle. Great for a wide-eyed anime inspired look. Diameter is 15.2 mm and base curve is 9.2 Usable for up to 3 months! 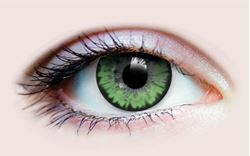 ACID II contact lenses from PRIMAL These contacts feature a black circle to imitate a dilated pupil, with a green outer circle. Great for any wide-eyed look, inspired by "anime" style eyes. Diameter of 15.2 and a base curve of 9.2 Lenses last up to 3 months! 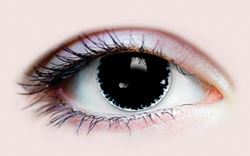 ACID III contact lenses from PRIMAL These contacts feature a black circle to imitate a dilated pupil, with a BLUE outer circle. 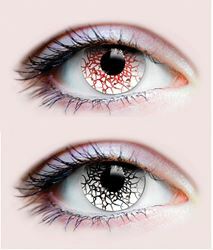 Great for any wide-eyed look, inspired by "anime" style eyes. Diameter of 15.2 and a base curve of 9.2 Lenses last up to 3 months! Feel the power of the BERSERKER! Allow the divine fury to wash over you and spread fear of your invincible power on the battlefield (also works for Halloween parties and conventions). Primal Cosmetic Contact lenses are an advanced hydrophilic made of polymacon. This allows more oxygen to pass thru the lens to the cornea, more resistant to protein deposits, less drying, less risk of infection, easier handling and lower cases of complications with extended use. Primal Cosmetic Contact lenses are an advanced hydrophilic made of polymacon. They are more resistant to protein deposits, less drying of the lenses, lower risk of infection, easier handling and lower cases of complications with extended use. Primal Cosmetic Contact lenses are an advanced hydrophilic made of polymacon. This allows more oxygen to pass thru the lens to the cornea, more resistant to protein deposits, less drying, less risk of infection, easier handling and lower cases of complications with extended use.